Just about an hour away from our Deep Creek Lake bed and breakfast, Lake Pointe Inn , you can find an architectural masterpiece by the legendary Frank Lloyd Wright. If you’re a fan of architecture or are looking for a fun and informative day trip outside of the inn, Frank Lloyd Wright Fallingwater tours are a great way to spend the day. Also called the Kaufman House, the Frank Lloyd Wright Fallingwater house was constructed in the late 1930s. Designed and built for businessman Edgar Kaufman Sr. and his family, Fallingwater is built partially over a waterfall and is located in Mill Run, PA near the Bear Run Nature Preserve. 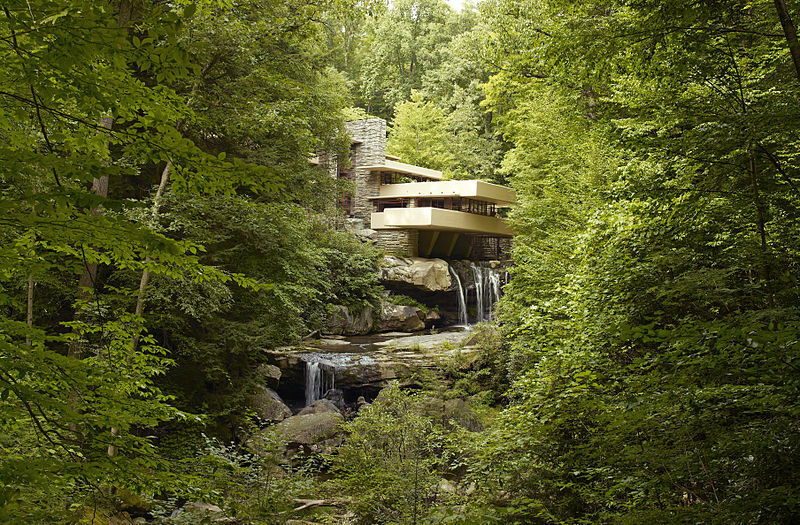 Fallingwater is a fantastic example of modern architecture set in nature. Wright wanted the home to look as if it belonged with the landscaped and therefore used an organic palette of colors. After it was completed, Time magazine called it Wright’s “most beautiful job,” which is no small compliment. The Frank Lloyd Wright Fallingwater house is now a National Historic Landmark and was voted the “best all-time work of American architecture” in 1991. To learn more about Frank Lloyd Wright’s Fallingwater history, click here. Fallingwater offers several different tours catering to visitors with different needs and expectations. All of the Frank Lloyd Wright Fallingwater tours are walking tours, so wearing comfortable shoes and clothing is recommended. Tour season is from March to December as the house is closed in January and February. Children age six and up are allowed on the Guided House Tour and age restrictions vary on the other tours. The basic Guided House Tour includes the main rooms of the house and lasts about an hour. If you want a closer look at the house the the In-Depth Tour of the house gives visitors more on its history and architectural significance. The Frank Lloyd Wright Fallingwater In-Depth Tour also goes into detail about the relationship between the landscape and the house. During the Sunset Tour you can really experience the brilliance of that relationship as the sunset fills the house with changing light. This intimate tour also includes hors d’oeuvres on one of the homes iconic cantilevered terraces. Or see Fallingwater in the morning hours during the Brunch Tour, which includes access to rooms not on the regular tour and a brunch served on the covered terrace. And if you’re a architecture aficionado and a huge fan of Frank Lloyd Wright Falling Water, then the Focus Tour is the most extensive. Since this tour is limited to you and two to four guests, you get personal attention. The Focus Tour also includes a luncheon at the house featuring seasonal dishes prepared by the Fallingwater chef. Daily grounds passes are also available, weather permitting. For tour info and ticketing, click here. When you’re planning your trip to tour Fallingwater, remember that staying in a Deep Creek Lake bed and breakfast will enhance your visit to the area. With great amenities and furnishings, Lake Pointe Inn has a selection of rooms and suites that will make your trip a memorable one. Each room has a private bath and a gas fireplace so you can relax in comfort. Your stay also comes with a full gourmet breakfast, or if you plan to get an early start to see the Frank Lloyd Wright Fallingwater house, we offer a continental breakfast. Book your room and start planning an unforgettable getaway today! Photo by Carol M. Highsmith .